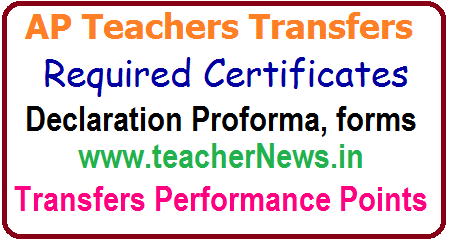 Teachers Transfers Application 2017 Certificates Upload, Submitted for AP Teachers Transfers List of certificates﻿ Download.Transfers Declaration Certificates useful for AP Teachers Transfers for Performance Points, AP Teachers Transfers 2017 Certificates, Proforma, Forms, Applications Performance category, special category, Preferential Category Points Certificates, Forms, Applications, AP Teachers Transfers 2017 Proformas, Forms, Applications Performance category, special category, Preferential Category Points Certificates, Forms, Applications , for Performance Points Download All Declaration Certificates useful for AP Teachers Transfers for Performance Points Andhra Pradesh Teachers Transfers 2017 Performance Points for Children Transition Raising funds NCC, Rationalisation Points, School average in SSC, Subject wise Percentages in SSC, Teacher Attendance, Spouse Points, National, State Awards, Residing at Working Habitation download all declaration certificates AP teachers transfers performance points. The preforms should be undersigned by the Head Master/MEO/DyEO as per the requirement. Teachers are suggest to download the preforms and make it singed properly and submit transfers application, check list along with evidential proformas as stated below. Needed Proforma, Certificates for Performance category, special category, Preferential Category Points Certificates in AP Teachers Transfers 2017 session, Newly modified Formats for andhra pradesh state teachers transfers 2017, Download All Declaration Certificates useful for AP Teachers transfers 2017. Andhra Pradesh Teachers Transfers 2017 Performance Points for Children Transition Raising funds NCC, Rationalisation Points, School average in SSC, Subject wise Percentages in SSC, Teacher Attendance, Spouse Points, National, State Awards, Residing at Working Habitation form. Certificate For Teachers Working As N.C.C Officer/ Bharat Scout &Guides (Vide Rule 7(Iv ) of G.O Ms No 32 Edn Dt 4.6.2017). AP Teacher's Transfer's 2017 Online Application required Certificates school education performances points, service points, requirement forms , Transfer's Online Application , Declaration forms ,willing letter of 2017 transfers teachers. AP School Educational introduce to teachers Transfer's Online Applications . AP Government teachers Transfer's Service points , Performance Points in Online Application . Required Certificates at Transfer's Application apply time. Rationalization willing letter , Souse certificate , Best Teacher Award Declaration , NCC officer's , Average attendance , Enrollment of Child info , AAS grades , SSC Results , School Development Forms and Certificates available . AP Teachers Transfers 2017 Proformas, Forms, Applications for Preferential Category Points, Performance points declaration certificates, Required Applications, Transfers needed official forms Download.